On Long Island, we preach about advocating for journalism all the time. Every Press Club event and outing is about making sure our members and the community at-large believe in the journalists doing great work all around us. With that comes the need to shed light on the history of journalism in our area as well. Three years ago the Press Club of Long Island developed a historic studies committee to research and place historic markers at various places of journalism significance across the island. With the help of local historians and town and village governments, we have now placed four historic markers. The latest was unveiled earlier this month. SPJ accepts applications each year to honor historic sites in journalism across the country. Using this idea, the Press Club figured we could just do this on our own. Typical Long Islanders! Our first marker was placed in the Village of Hempstead on April 14, 2016, honoring the site where Newsday was first printed in 1940. A month later on May 31, 2016, a second historic marker placed, this time in Huntington, N.Y., to commemorate the spot where Walt Whitman first published The Long-Islander in 1838. The waterfront Roslyn Harbor, N.Y., home of William Cullen Bryant was a magnet for artists and writers who traveled there in the mid-1800s to consult with Bryant, a well-known poet, editor, writer and critic. The historic marker placed on April 22, 2017, at his Cedarmere estate, celebrates Bryant’s role as editor of The New York Evening Post from 1829 to 1878. As editor, Bryant pushed for the abolition of slavery, championed American art libraries and parks and supported Abraham Lincoln and the Union cause during the Civil War. And on June 6 of this year, we went all the way back to 1791 and honored the first newspaper in Long Island history, Frothingham’s Long Island Herald. 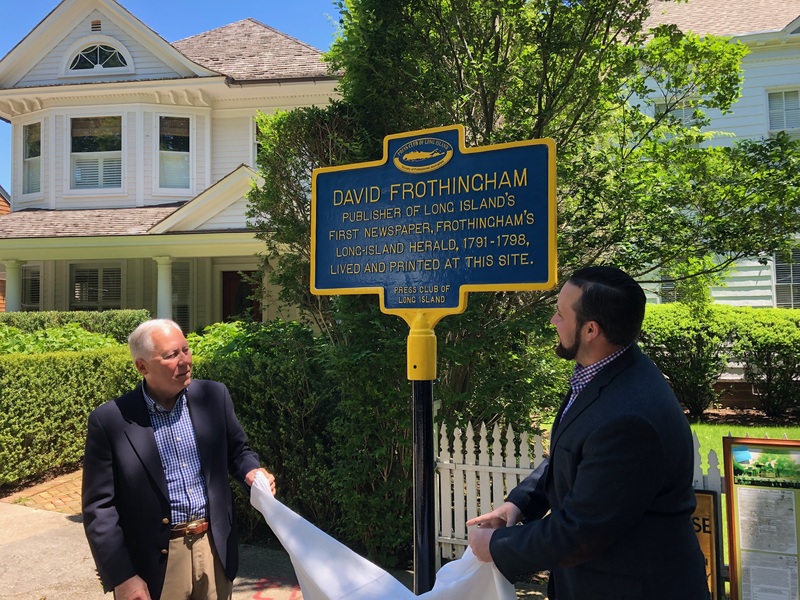 In partnership with the Sag Harbor Historical Society, the Press Club honored the location where David Frothingham published the first newspaper in eastern Long Island. Chris R. Vaccaro is immediate past president of the Press Club of Long Island, SPJ’s Associate Region 1 Coordinator and a journalism professor at Hofstra University, where he is adviser of the university’s student SPJ chapter.